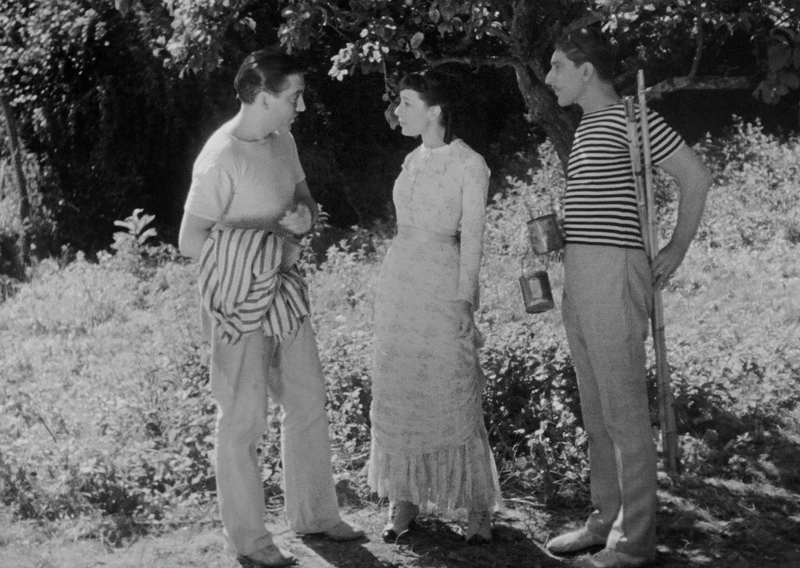 Jean Renoir may have left his 1936 film, A Day in the Country unfinished, abandoning it to work on 1937's Grand Illusion after a run of bad weather caused a delay in production, but even in its incomplete form it somehow still feels like a complete and satisfying work. 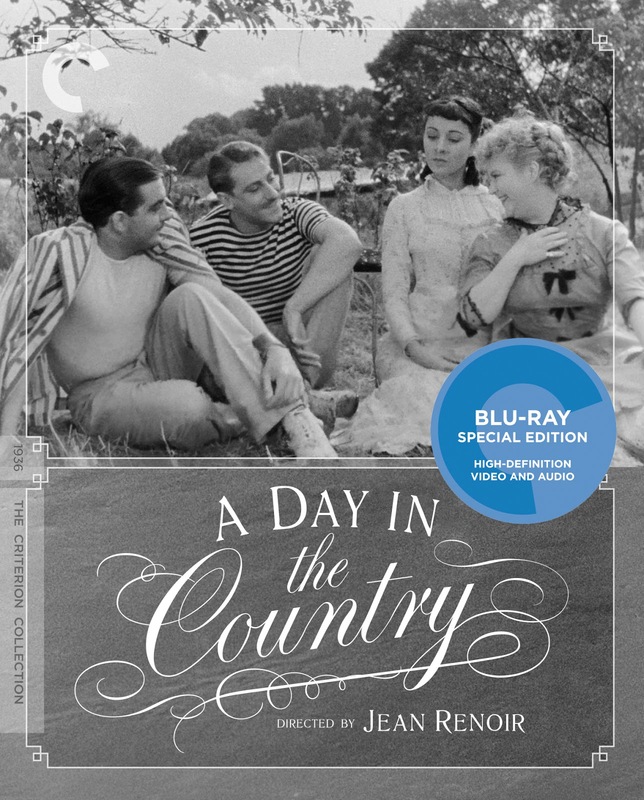 Based on a story by Guy de Maupassant (a friend of Renoir's father, painter Auguste Renoir), A Day in the Country, deftly combines his father's idyllic view of country living with de Maupassant's darker fatalism. It's the story of a bourgeois Parisian family heading out to the country for an afternoon getaway (a pastime of the French upper crust that greatly annoys the provincial locals). Once there, the mother and her lovely daughter (who is engaged to a clueless buffoon at the behest of her family) become the object of admiration for country folk, two of whom invite the ladies for a canoe trip down the river. Along the way, the daughter finds herself drawn to her mustachioed suitor, who will give her an encounter she will remember for the rest of her life. Renoir masterfully suggests not only the loss of the daughter's innocence (in a truly haunting closeup in which she looks directly into the camera), but also the wistful melancholy of the chance encounters of youth as time inevitably marches on. It may only be 40 minutes long, but Renoir is in top form here. It's hard to imagine this as a longer film, but one can't help but wonder - if A Day in the Country is this good in its truncated form, how major would it have been if Renoir had completed it? It's almost as big a "what if?" as the central question of the film, reflecting on what life could have been when those idyllic moments of the past are gone and cold, hard reality takes their place. We get a glimpse at the film that might have been on the Blu-Ray, which offers Criterion's usual wealth of extras, including outtakes that are longer than the film itself, as well as an insightful interview with Renoir scholar, Christopher Faulkner. The new transfer beautifully captures Renoir's lyrical imagery, which in turn evokes the landscape paintings of his father, Auguste. The images are still soft, as one would expect from a film from this time period, but they seem more focused, more robust. The softer focus employed here almost makes the film seem more painterly, as if Renoir were bringing the paintings of his father to life on screen, while delicately skewering their romantic idealism. Renoir's lovely mise-en-scene, and in turn the countryside itself, almost becomes its own character, just as important to the thematic integrity of the film as the characters themselves (if not more so). Here, Renoir is both romantic and realist, incorporating the ideals of both de Maupassant and his father, Auguste, looking with wistful longing at the bygone days of youthful abandon and the often aching reality that follows. It's one of Renoir's most bittersweet works, a film that, just like the country life it depicts, feels beautifully, perfectly incomplete.